Views in the South Seas, from drawings by... James [sic.] Webber, draftsman on board the Resolution, Captain James Cooke, from the year 1776 to 1780. London: W.Bulmer & Co. for Boydell & Co., 1808 [but later, plates watermarked 1819]. Large 2° (540 x 415mm). 16 etched and aquatint plates, printed in sepia and coloured by hand, after Webber. (Plate XII slightly creased, plates XII, XIII and XIV with small pieces of dried gum adhering to image area, occasional light spotting.) 20th-century green half morocco, spine gilt with two morocco lettering-pieces (endpapers creased, a few small tears). A later issue with post-publication date watermarks to the plates. 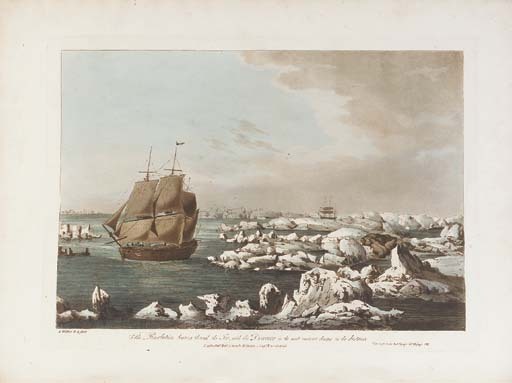 A fine series illustrating scenery encountered by Webber during Cook's final voyage and including images of the Bering Strait and Kamchatka. 'Cook's third voyage was organized to seek the Northwest Passage and to return Omai to Tahiti. Officers of the crew included William Bligh, James Burney, James Colnett, and George Vancouver. John Webber was appointed artist to the expedition. After calling at Kerguélen Island, Tasmania, New Zealand, and the Cook, Tonga, and Society Islands, the expedition sailed north and discovered Christmas Island and the Hawaiian Islands... Cook charted the American west coast from Northern California through the Bering Strait as far north as latitude 70° 44' before he was stopped by pack ice.' (Hill pp.61-62). These plates appear to have been issued first by Webber himself between 1788 and 1792 with the etching and hand-colouring carried out by Webber himself and the aquatint probably by M.E.Prestel. After his death in 1793, Webber's plates passed to Boydell who re-issued them in 1808. The present issue, with plates watermarked 1819 and text 1805-1806, is probably the next issue and is followed by at least one more issue with later watermarks to both plates and text (i.e.Abbey Travel II, 595). Cf. Abbey Travel II,595 (variant plate order); Hocken p.35; Mitchell 1872.